I love fresh grown vegetables, so I am fortunate to have a Mother with a green thumb who guides me through the process of gardening. She helped me build my gardens about five years ago. The ground here is very hard and full of rocks, so we decided the raised bed was the best way to go. We built the frames with 2×4’s and decided where they would be, then layered the ground with newspapers. The papers are meant to kill the grass and weeds from under the garden and hopefully prevent them from growing through later on. They are also biodegradable, so eventually they will just become part of the ground. My gardens, 3 years ago. We filled the raised beds with soil and fertilizer. 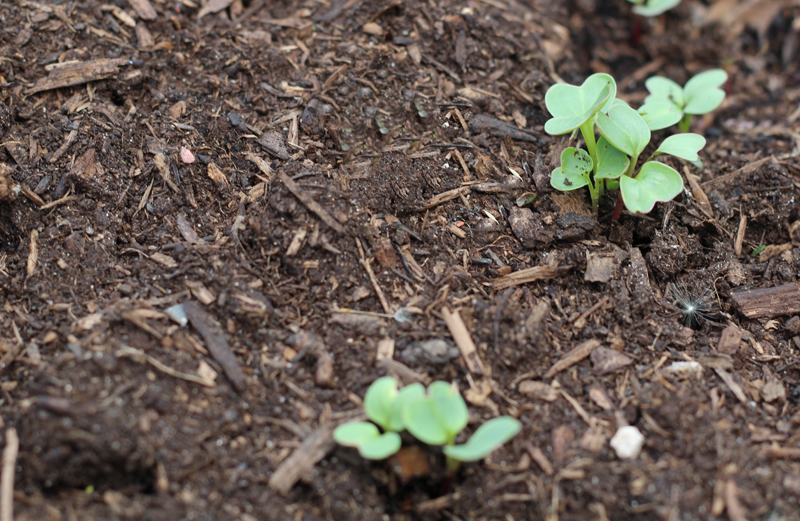 You want to make sure to pack the soil down or you won’t have enough soil for your plants. Once the gardens were ready, we planted. My Mom made a grid to lay over the garden so you can plant your seeds or plants in 9 even sections of each square garden, and more for the larger garden. She also taught me to graph out what I was planting so I would never forget. I followed her methods for the first few years, with great success. Last year was a particularly busy year, and I did not plant my garden. My Mom added leaves to the gardens to reduce the weed growth, but I still had a lot of weeks to pull before I could get started this year. I cleared the weeds and added soil, and then I planted. I stopped using the grid a couple of years ago and I was in a hurry so I didn’t worry about graphing my garden. That was a mistake, because now my garden is full of surprises. Meaning, I will find out what’s planted once it grows! The first garden I planted has my pepper plants and tomatoes. My Mom grows these in her greenhouse, but you can buy them at most garden supply stores. 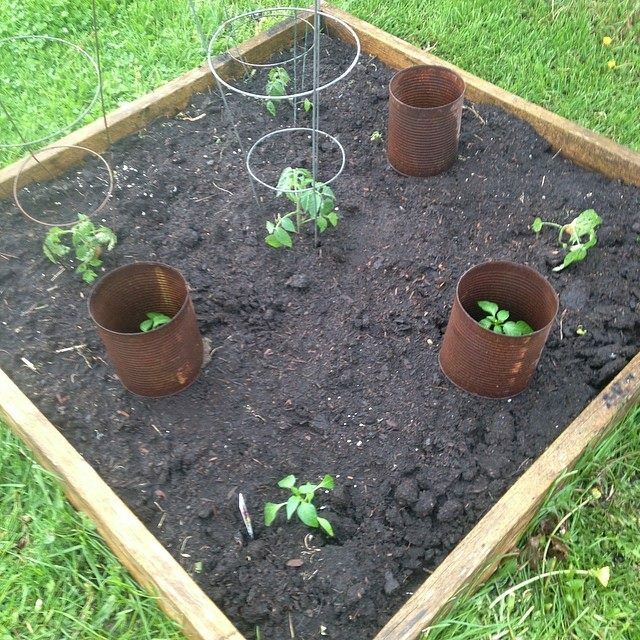 The tin cans are to prevent the bunnies from stealing my new plants. One year I planted my tomatoes and peppers and the next morning there was absolutely no trace left of them. I was not pleased! The tomato cages also seem to deter the bunnies from taking the plants. I didn’t have enough cans, and as a result the pepper plant in the bottom corner was eaten a bit. You can see that a week later, these plants are doing very well, even the one that was damaged. 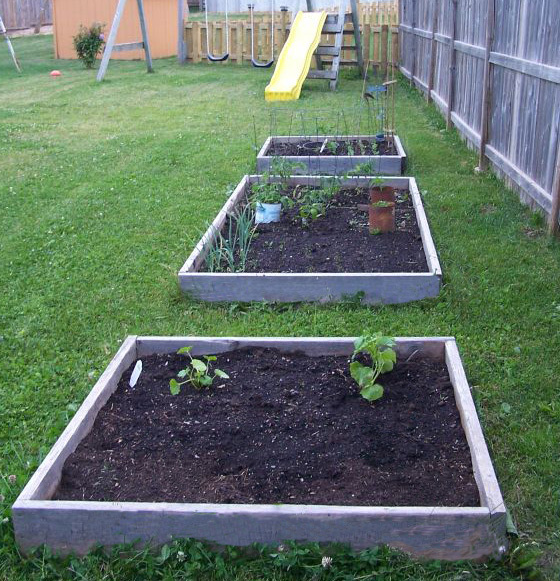 The large garden has two kinds of zucchini and two types of cucumber planted on mounds. I left enough space around each mound to allow the vines to have a place to go without tangling into another plant. 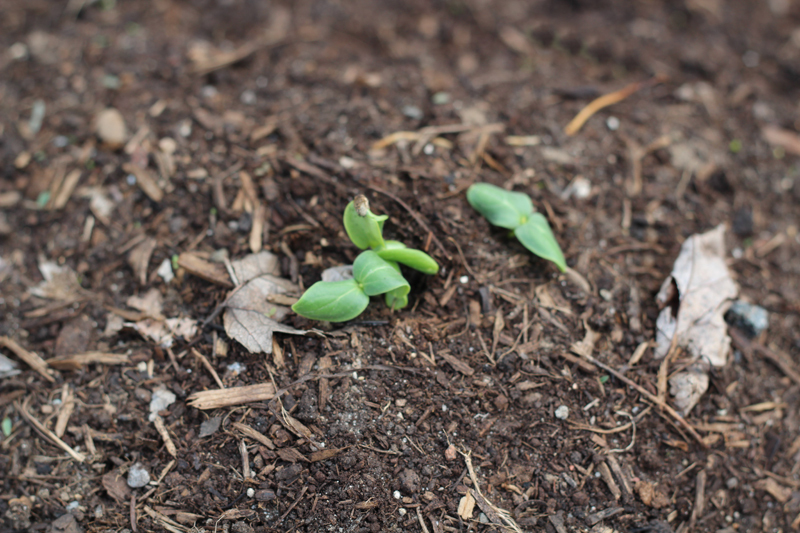 These grow quickly and this week I already see sprouts on each mound. There are carrots planted in the other half of the garden, but they were just planted a couple of days ago. I gently raked the soil, sprinkled the carrot seeds and raked the soil back over the seeds before watering. I will need to thin them as they grow. 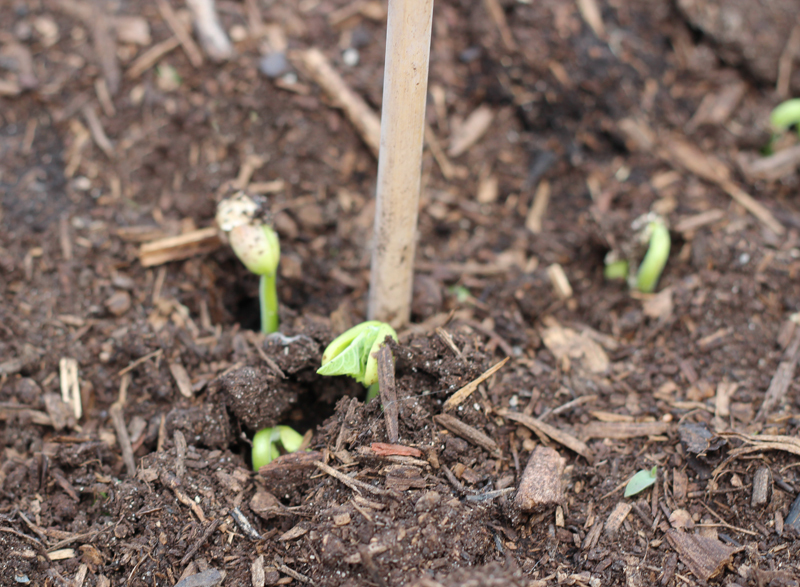 And the beans are quickly growing. I have bamboo sticks along the row for them to grab onto, but I need to tie a string between each stick to add a horizontal item for the vines to grab. It is so much easier to pick beans that are not on the ground. I planted onions around the outside edge of each garden. This helps to deter animals, and allows the maximum use of space. 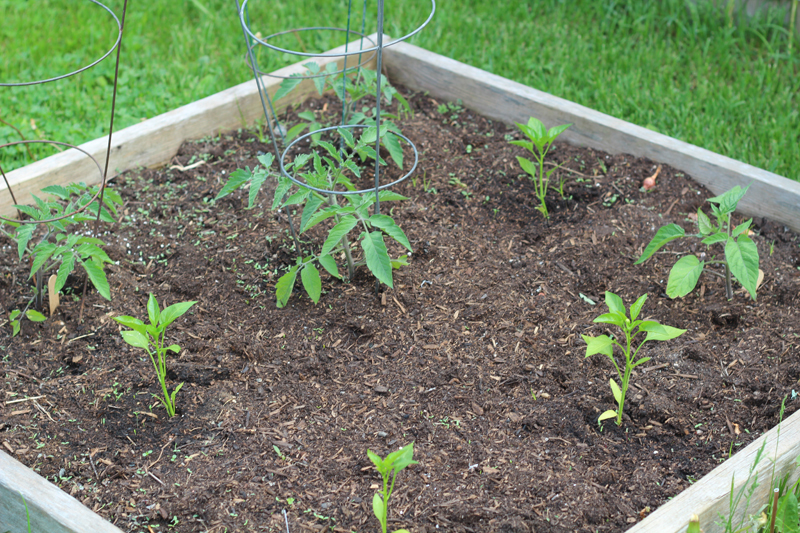 Marigolds are great to plant around your tomatoes and peppers to keep bugs away, and spraying a mixture of dish soap and water will also help keep the bugs away. I look forward to sharing my garden with you each week! Please share your gardening tips too. So fun to see the new plants growing! I can’t wait to follow the garden’s progress! I think the second last picture is radish not lettuce. I only know because my radish look just like that 🙂 I grew my beans in pots this year since slugs got them last year…not quite sure what to use for them to grasp on to in the pots…will have to invent something! Look forward to watching your garden grow! Well that would make sense because I planted the lettuce and radish near each other. Thank you! I miss being able to do a garden. We’re in an apartment at this point in life, for the past 2 years… I am doing a few plants on my balcony this year. We are attempting to grow a few things on our balcony this year. We just moved and have a balcony that gets alot of sun, so wish us luck! once we get our deck built next year Im doing this I love this idea looks so nice and neat. I am a vegetable garden fail. The rabbits help themselves before I can enjoy any of it.